If Reception is closed, you can try the Student Administration window, or use the telephone located outside Student Administration, on The Street. (There is a Computer Lab telephone directory by the phone). Lost property can be handed into and reclaimed from Reception. Any property not claimed within 6 months will be disposed of. 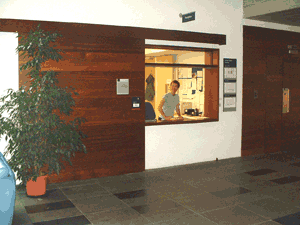 There are various facilities available for Lab members in the Reception area. For more details, see our Information for Staff pages.